Winter Workshops 2018-2019 | P.A.R.T.S. During the winter of 2018-2019, P.A.R.T.S. organises three long weekends of workshops for those interested in applying for the Training Cycle auditions in the spring of 2019. 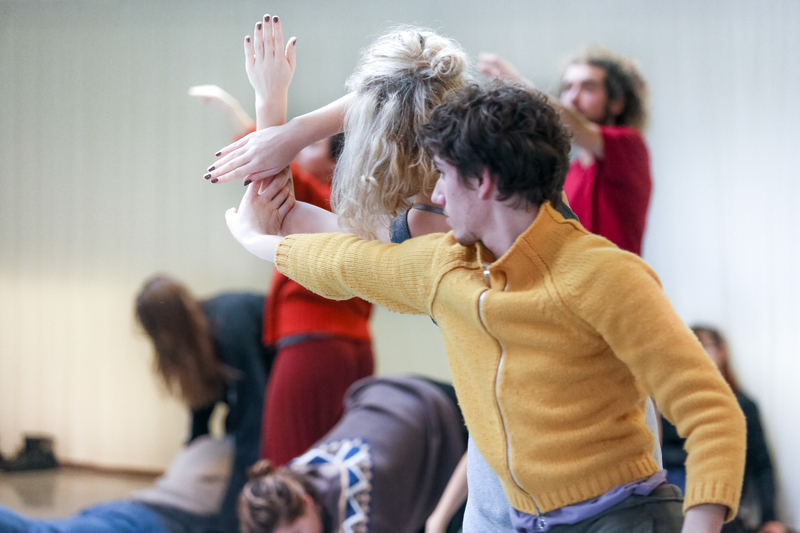 For the workshops we accept the same age limit as for participants of the Training Cycle auditions: you have to be at least 18 and maximum 23 years old (both ages on Dec 31, 2019). During this class we will be introduced to Yoga as a holistic practice. The five points of the holistic system are: proper exercise (Asana), proper breathing (Pranayama), proper relaxation (Savasan), proper diet (vegetarian), positive thinking and meditation (Vedanta and Dhyana), although we will mainly work on the first 2-3 points. We will go through the basics of the Yoga practice to get a clear understanding on alignment, what are we opening, strengthening and stimulating in each asana/position, to remove unhelpful body patterns and using the breath to open up and grow in awareness. The ballet class evaluates and re-evaluates the dancer’s body and is built on the classical structure of a ballet class with the objective to focus on strengthening the dancer’s awareness of his or her own natural alignment and experience. The class is divided into two parts: the barre and the center practice. Exercises at the barre emphasize isolating and releasing the joints in order to strengthen the dancer's core awareness and to find where the movement begins in the body. By supporting the functional body placement, it becomes more natural and fluid, rather than stiff and held, allowing the movement to be less stressful. The second half of the ballet class, conducted in the center, continually challenges the dancer to use the newfound placement when having to shift weight and carry the body through space. Motivation, flow of movement, and momentum are key points to help the dancer to move from the core and inner muscles supporting a greater freedom of dynamic and expression. The dancer gains a stronger sense of confidence to take space and go beyond technique. Our practice will begin with a warm-up integrating breath and movement, giving students time to sense their internal environment, the weight of their body, and simple articulation of the spine and joints. Improvisational tasks drawn from and inspired by Brown’s work are used to bridge internal and external awareness, bringing us into contact with each other and the space we occupy. Finally, we’ll begin to taste the fundamental principles embodied in the Trisha Brown Dance Company’s style as a repertory phrase is introduced. Simplicity, physical stability, ease, spatial clarity, balance of internal/external sensing and movement initiation are emphasized in approaching phrase material. Drumming (1998) is one of the most fascinating choreographies that Anne Teresa De Keersmaeker/Rosas created. We will work on the seven basic materials of Drumming and with this material you will make a personal transformation and composition in the same way as we did with the company. We will also try to make something new with your own material. Contact improvisation is a duet dance form, in which the partners are more or less in constant physical contact, touching different surfaces of each other's bodies and sharing more or less weight. Through this form, we can explore and train principles of dancing that can be useful in other dance classes: the weight and volume of our body, how we relate to gravity, and how we can use the momentum of our body for directed movement; our reflexes; our ability to react to unknown situations; spiraling through our body and exploring its oblique cross-connections for dynamic stability and core strength; and the fun of dancing with others. In this class, I will teach the basic skills of contact improvisation. We will explore our contact to the floor, rolling, and the possibilities of dancing through contacting with a partner. We will slowly work our way up to standing, learning how to use our reflexes to fall safely and how to consider anything that happens part of the dance with our partner. My approach mixes focused exercises to learn certain skills, and frames for dancing with each other, playfully exploring the possibilities of a meeting, not worrying about the skills but letting them emerge instead. Sometimes we will also talk to share our experiences and findings, and sometimes we will watch each other dance. The composition workshop is for those who are interested in artistic creation and wish to develop their own choreographic writing. The aim of the workshop is to allow everyone to broaden their gestural vocabulary by researching and experimenting composition tools inspired by those of musical composition and where the only limits and boundaries are those imposed by the abilities bodily and not those imposed by any technique (classical, contemporary, jazz, hip - hop or other). Tale will be teaching a dance class based on her personal warm up. We will go through the whole body, gently but thoroughly. The warm-up aims at maintaining strength and flexibility of the body. Coordination and working with multiple directions are an integral part of the movement-material. Both within the body and in the room, we work with awareness of directions and focus. The aim is to wake up the body and the mind. In Rain, De Keersmaeker approaches the company of dancers as a close-knit group of pronounced individuals who, one by one, play a vital role in the whole. Rain, set to Steve Reich's Music for 18 Musicians (1976), is one of Anne Teresa De Keersmaeker’s most characteristic performances. The mathematical figures, the sustained repetition, the geometric occupation of the space, the art of continuous variation – everything that had gradually become the choreographer’s signature was pushed to the extreme in Rain.